ABC screens a 6 part factual Making Child Prodigies, profiling five gifted children and exploring what it takes to be a child prodigy. The series includes coach Alan D. Thompson, Chairman of Mensa International’s Gifted Youth Committee and Education Consultant Michele Juratowitch, co-author of Releasing the Brakes. Prodigies are a rare phenomenon – awe-inspiring, yet barely understood. In Australia, there are less than 4,000 exceptionally gifted children under the age of 12, and of those, it’s estimated that less than a hundred could be considered real prodigies. During this series, we follow five extraordinarily talented children from around Australia and ask – what does it take to be a child prodigy? Lifting the lid on the elite worlds of dance, music, academia and fine art, Making Child Prodigies provides an intimate and candid look at the day-to-day lives of a special group of children and their families at a pivotal time in their careers. 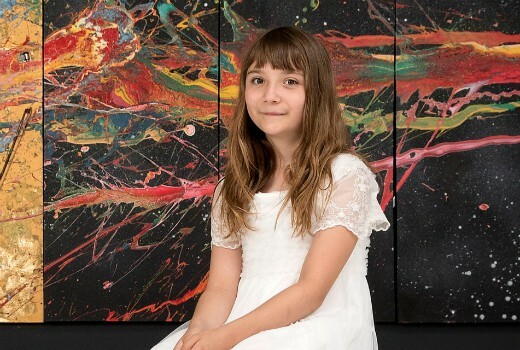 We meet 10-year-old Aelita, an internationally renowned abstract painter who is getting ready for her homecoming exhibition in Melbourne; eight-year-old pianist Anwen, a student at the prestigious Juilliard School of Music in New York who is preparing for her first public performance of her original compositions; 12-year-old Callum, a heavy metal guitar playing maths whiz who is recording his debut single; 10-year-old dancer Kenzie who is preparing for her toughest audition yet; and eight-year-old intellectually gifted scientist Finn, who has an important meeting lined up with the Prime Minister of Australia, Malcolm Turnbull. While capturing our imagination on the scope of human potential, the journey to success for a gifted child requires immense sacrifice. Parents pour time, money, and unwavering commitment into the pursuit of a shared dream, while children with adult minds, adult abilities and adult peers can result in a fast-tracked childhood. With a talent beyond the realms of normal, can being gifted sometimes be a curse? At a time when society seems increasingly interested in measuring talent, and being ‘special’ is every child, and parents’ expectation, the pressure is on this unique group of children to live up to their potential. Filming over five months in Melbourne, Canberra, Rockhampton, regional New South Wales and New York U.S.A., this illuminating and entertaining series explores whether prodigious talent is down to nature or nurture, and what family conditions maximize success. 8pm Tuesday May 29 on ABC.